Last week I was delighted to join a workshop at the Hong Kong Maritime Museum on the history of weather science and weather extremes in the region. The workshop brought together historians of science with atmospheric scientists interested in using historical observations to reconstruct past weather and climate. It was a great day of cross-disciplinary exchange and learning, and I was able to make some really useful connections with people working on similar times and places as me. Discussions ranged from the way 19th century sailors dealt with typhoons, through the imperial networks of weather observation that sprung up around the China coast, to the use of historical weather data from the region in challenging climate models to ‘hindcast’ known weather events. Interestingly, the skill of models to spontaneously generate known weather events – like typhoons for example – is such that they can now venture to be used to predict events which might not be known in the historical record, allowing historians to then go and search for what might be forgotten extreme events. Following the workshop, I’d been generously invited to give a public keynote on my ‘imperial weather’ project, so I took the opportunity to give another airing to some of my airship material, which connected with a lot of the recurring themes of the workshop: empire, extreme weather, the history of prediction, and, of course, disasters. The following day I ambled over to the Hong Kong Public Record Office, which holds archival records from Hong Kong Observatory and various other institutions, stretching back into the early days of the colonial era. The Hong Kong Observatory is probably the most well-documented of all the British colonial observatories, and it was keep overwhelming to encounter the wealth of material available. That means, of course, that there is a uniquely large secondary literature on the history of meteorology in Hong Kong, which is also motivated of course by the significance of typhoons for life and fortunes in the region. For some examples, see here and here. I tried to follow a few significant threads into the archives, including the move of T.F. Claxton from Mauritius to Hong Kong, and the spatial politics of the observatory itself – the defence of the site against various encroachments, and its functioning as a mini scientific world set apart from the growing city; a space not just for meteorology and astronomy, but for natural history and botany too. I also took the chance to take a look at some of the observations which were made by meteorologists interred in Japanese prison camps during the WWII occupation. Many of these were made on whatever scraps of paper were available – cigarette packets, match boxes, animal cracker cards, some of them with remarkable levels of precision, even extending to the plotting of monthly averages on tiny graphs. One example of the observations can be seen here. I was delighted to hear this week that my article ‘For an empire of all types of climate’: meteorology as an imperial science was placed in the ‘highly commended’ category for this year’s Journal of Historical Geography essay prize, along with Dean Bond’s Enlightenment geography in the study: A.F. Büsching, J.D. Michaelis and the place of geographical knowledge in the Royal Danish Expedition to Arabia, 1761–1767. The (very deserving) winners of the overall prize were Briony McDonagh and Carl Griffin for their piece Occupy! Historical geographies of property, protest and the commons, 1500–1850. Thanks to the staff at the National Meteorological Library and Archive in Exeter and to the librarians at the University of Oxford for all their invaluable assistance. Thanks also to Mike Hulme, Helen Pallett and seminar participants at King’s College London and the University of Nottingham for helpful comments on earlier versions of this paper, and to Joan Kenworthy for her insight into the East African archives. The support of an RGS-IBG Small Research Grant and of the Department of Geography, King’s College London is gratefully acknowledged. The article has greatly benefitted from the comments of Miles Ogborn, the editor, and of the three anonymous reviewers. In a few weeks’ time I’ll be heading over to Malaysia to spend some time in the archives there, as well as to visit the University of Nottingham’s campus (UNMC) just outside Kuala Lumpur. 1 March: Public talk at the Hong Kong Maritime Museum, An Empire of the Skies: Airship Science and the Imperial Discovery of the Atmosphere. This will follow a workshop with a group of historians of science working on meteorology in the region in the 19th and 20th centuries. Recently I’ve been doing a lot of thinking about the airship as a speculative technology, particularly its history as an imagined agent of imperial connectivity in interwar Britain. More broadly I’m interested in how meteorology was used in this period to make the atmosphere legible and traversable, and a lot of the motivation for the development of wider meteorological infrastructures was the promised expansion of aviation following the technological advances of World War I. The airship, however, makes different meteorological demands than the heavier-than-air aeroplane. Airships work through the dynamic relationships between the gases enveloped within the ship and the atmosphere outside the envelope, and its characteristics of temperature, humidity, pressure, wind and so on. While aeroplanes use speed and aerodynamic design to produce lift, airships create lift through a set of more subtle relationships, which must be constantly monitored and tinkered with to ensure smooth flight. Changes in one relationship – relative temperature for example – imply and require compensatory changes in others – such as relative pressure. Although airshipping is predicated on sealing gases within, it also requires the constant venting and valving of gas, to maintain a dynamic equilibrium between enveloped and enveloping atm osphere. Airships are examples of what Derek McCormack calls ‘aerostatic things’ – things which generate lift through these relational dynamics, the most obvious example being the humble balloon. McCormack’s done a lot of important work on the affective aspects of balloon flight, and on the relationships between affective and meteorological ‘atmospheres’. The reliance of balloons of these relational dynamics, and their capacity to be affected by changing conditions of their atmospheric surroundings, mean they have become a central tool in making atmospheric dynamics visible, as McCormack has pointed out (see his recent piece in Society & Space). But if balloons have made the atmosphere visible for meteorologists, what I’m interested in is how meteorologists likewise made the atmosphere visible for balloons or, more specifically, for airships, and their captains and navigators. Alongside these synoptic efforts sat a new set of practices of studying the atmosphere on a new, finer scale. The vertical structure of the atmosphere had been a growing object of meteorological concern since the late 19th century. But the particular characteristics of airships – their capacity to affected by the wind, to be destabilised by the subtlest changes in atmospheric conditions – meant that the atmosphere as a medium demanded new strategies of knowledge-making. The gustiness of wind was measured on new, finer timescales; the effects of relatively minor changes in topography on the structure of the overlying air were newly appraised. The airship is ther efore a propitious figure through which to think about the relationships between the gaseous materiality of the air and human action, and to examine how historical actors have sought to make these relationships visible, legible, predictable, and subject to what we might now call ‘risk management’. 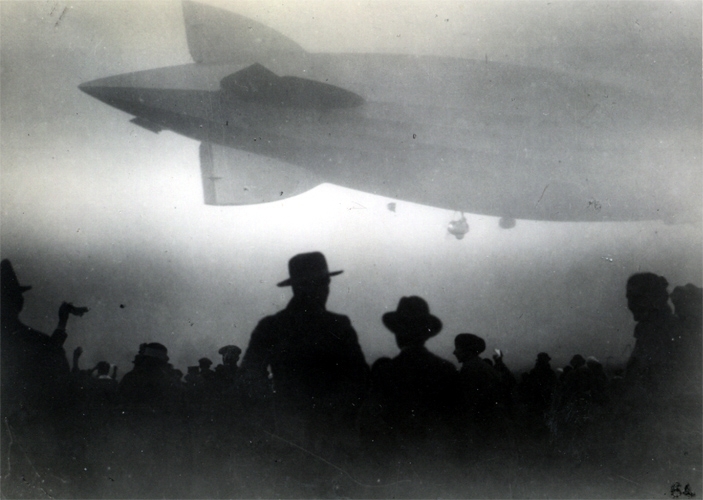 The relationship between airship and atmosphere became a site of epistemic controversy during the development of the imperial scheme, with a number of critics claiming the impossibility of stable flight, and challenging the widely propagandised claims of luxurious long-distance travel, and of ‘fox-trotting in the clouds’. When the flagship R101 crashed into a hillside in northern France on its maiden voyage to India, amid strong winds and driving rain, much of the subsequent inquests focused on the ship’s dynamic stability, on weather forecasts which underestimated the storm, and on the responsibility for the decision to fly in spite of forecasts which nonetheless suggested a difficult journey. The moral economy of the decision to dive into this violent atmospheric milieu that night in October 1930 was unpicked and debated in settings from the popular press, an official Court of Inquiry, and a series of extraordinary séances with deceased crew members. In the end, responsibility was not laid upon any individual but was, interestingly, given to what was described as an distinctive atmosphere of urgency, expectation and impatience which existed in-between the different groups of actors involved. The airship, particularly the imperial airships of the 1920s and ‘30s, therefore provide an ideal figure through which to think through the intersections of material and affective atmospheres. But they also provide an opportunity to write the meteorologist into emerging literatures on the cultural and elemental geographies of air and atmosphere, and perhaps to re-consider the permeability of the boundary between matter and affect in the moral economy of weather knowledges and prediction. I explored some of these ideas in a recent paper at the RGS-IBG annual conference and a subsequent seminar with the London Group of Historical Geographers. I plan to write it up into a full paper at some point next year, after a few more archival forays, particularly regarding the séances which, I suspect, may hold the key to understanding much of the story of this intersection of technology, atmosphere and risk. I’ll be penning a few more blog posts along the way, as my thinking develops. A 1924 cutaway plan of R101’s interior. Source: Airship Heritage Trust. I have a new paper out in the RGS-IBG’s relatively new open-access journal Geo: Geography & Environment, entitled ‘Picturing the future-conditional: montage and the global geographies of climate change‘. The paper will form part of a themed issue on global environmental imagery being convened by historian of science Sebastian Grevsmühl. The introductory essay by Sebastian is also available online, and others papers will be following soon. The paper is the outcome of a long-standing side project on how artists and designers have sought to represent the possible effects of global environmental change in very local settings, often through strategies of visual composition such as montage, collage and graphical manipulation. I’m interested in how such images play on ideas of place, and how the representation of spatial otherness functions as an analogue for futurity. There are some interesting parallels with the main themes of my current project – i.e. how colonial actors sought to come to terms with climate – scientifically, but also politically and normatively. Imperial ideologies were shot-through with ideas of climatic determinism, of racial superiority shaped by climatic superiority, and many of the practices of colonialism were informed and directed by ‘imaginative geographies’ of climatic excess, danger and inhospitability. Regional climatologies, describing the stable characteristics of the climates of distant places, were also moral climatologies, to borrow David Livingstone’s term, speaking of stable orderings of people, place and environment. An advert for Bile Beans, the “medically tested laxative” from Australia, c. 1900. Reproduced in Jackson, ‘A Very Short Introduction to the British Empire’. The montaged climate futures which I examine in the paper work by disrupting some of these deep-seated notions of climatic otherness, and of related fears of the destabilisation of our moral climatologies. But this destabilisation narrative also has a long history, which can be read from the genealogy of the ruin in western European art. Fantasizing about the future ruins of one’s civilisation was rarely subversive; rather it played upon notions of the grand endurance of civilisation’s artefacts beyond the timescales of shifting human fortunes. To imagine ruination was to promise immortality. Images of climate-changed futures often work by constructing a stable, happy order tensed on the verge of transformation, often of a catastrophic, ruinous nature. They don’t tend to engage with present-day instabilities, injustices and inequalities; rather, the present emerges as a curiously stable thing, only to be turned upside-down by a cast of climatic, biophysical and cultural Others. Again, there’s a long (and decidedly imperial) history to this kind of thinking. However, I argue in the paper that the historical radicalism of montage as a mode of artistic production offers the seed of more progressive, reflexive kinds of future-visioning. ‘Reflexive’ in the sense that montage makes clear the choices and cuts made by the artist. The decision of what to add in, and what to leave out, becomes part of the representation itself. There are some radical lessons in there not just for the visualisation of climate-changed futures, but for much broader modes of constructing futures, where the black-boxing of such choices can have significant epistemic and political consequences (see, for example, the ongoing controversy over the under-acknowledged inclusion of certain ‘climate engineering’ technologies in recent climate change scenarios). More of the images on which I based my discussion can be found collected together here. What do we talk about when we talk about climate? This Thursday (14th July) we will be hosting Vladimir Jankovic, an historian of science at the University of Manchester, for a public lecture on the question of ‘What do we talk about when we talk about climate?’ The talk will form the first Hayman Rooke Lecture in Environmental Humanities, a new lecture series with which we aim to promote some of the great work happening in Nottingham and beyond at the intersections of environmental change and the humanities. Vlad’s work will be known to anyone interested in the history of meteorology and the intellectual history of climate. He’s long been a friend to geographers, arguing in Reading the Skies for a spatial turn in the history of meteorology, and pioneering work on the significance of space, place and scale in understanding the production and circulation of ideas about climate and its changes. His talk will coincide with a workshop at Nottingham which will aim to finalise the contents of an edited book featuring some new conversations between historical geographers and historians of science on these topics – more about that soon. Vlad will trace some of the history of architectural dealings with climate, to examine how the idea of climate itself is about much more than a physical atmosphere, but about the ways we inhabit our worlds spatially, culturally and ethically. His abstract appears below, a registration for the talk can be completed here. Drawing on select examples of the ‘environmentalization’ of modernist projects, this public talk reflects on how the language of ‘climate’ (and weather) informs the spatial rendering of everyday life and, conversely, how such a rendering informs the meaning, scale and relevance of ‘climate’ in ideas and their spatial manifestation. How do architectural and urban planning concerns shape different understandings of climate? What kind of socio-cultural concern underlies a climatological approach and, equally, what kind of approach underlies a climatological solution to the production of architectural and urban space? More generally, how does ‘climate’ emerge in locution, space and practice? Despite still being in the relatively early stages of the project, plotting various archival forays and seeking to narrow down some of the thematic areas I’m interested in developing, I’ve got quite a few writing tasks on the go. The first of these is a review article for WIREs Climate Change on ‘Climate & Colonialism’ which I’m writing with my Nottingham colleague Georgina Endfield. In this we hope to crystallise recent debates about how ideas of climate informed ideas of empire, but also to examine recent scholarship in other areas of environmental history which have dealt with some of the more prosaic practices by which colonial actors came to terms with climatic difference, extremes, and change. This will build on the classic works of the likes of Richard Grove, David Livingstone and Morag Bell, but will also examine emerging research in agricultural history, the history of colonial forestry, and medical history. The aim is to tease out some of the links between broad ideologies of climatic difference, and the more concrete practices of making knowledge about climate in colonial settings. I’ll be contributing a chapter to the book which will focus on the postwar Groundnut Scheme in Tanganyika, examining the processes of expert advice which went into the planning of the scheme, and focusing in particular on the role of Albert Walter. He was the founding director of the British East African Meteorological Service and played a controversial part in the setting-up of the Groundnut Scheme. Taken on as an official meteorological advisor, he clashed with more ecologically and agriculturally minded experts over the rainfall at the proposed sites. As I described in a previous post, he was subsequently relieved of his duties, and watched on with a grim sense of ‘I told you so’ as the scheme succumbed to successive droughts, and as even the latest ideas on artificial rainmaking couldn’t coax a good crop of groundnuts from the parched soil. One other writing project which will hopefully be wrapped-up soon is another edited collection I’m helping out on, this time with historian of science Matthias Heymann and philosopher Gabriele Gramelsberger. The book, ‘Cultures of Prediction in Atmospheric and Climate Science’, gathers together a range of science studies scholars, along with some practicing atmospheric scientists, to examine the shifts brought about by the emergence and spread of computation and simulation in efforts to study and predict the atmosphere. All the chapters are now in place save for an expanded and revised introductory section which we’ll be working on over the next few weeks. Hopefully it’ll be on its way to bookshops and library shelves in the not too distant future though, courtesy of Routledge’s environmental humanities series. meteorology in a session I’ve put together with Angelo Matteo Caglioti (Berkeley). The session, ‘Historical geographies of environmental knowledge: science, space and power‘, will bring together historical geographers and historians of science to consider the relationships between environmental know-how and political action across a range of contexts, from Italian colonial Africa to the US Midwest. The title I put forward was ‘Weather, climate and the colonial imagination: Albert Walter’s agricultural meteorologies’, although I’m thinking now that I should change the post-colon part to ‘spatial histories of agricultural meteorology’, as I was to use the paper to try and develop some conceptual arguments about how to deal with the geographies of meteorological practice and its applications in contexts of colonial development schemes and the like. I’m going to play around with the notion of experimentation, which has been a concept and object of growing interest to geographers recently, using the empirical case of the British government’s notorious groundnut scheme to think about how the different ends of experimentation – authoritative knowledge, material transformation, commercial gain – interact and shape each other, and what this has meant historically for the relationships between scientific expertise and decision-making. as able to closely study the work of Albert Walter, a government meteorologist in Mauritius (1897-1926) and then in British East Africa (1926-1948). He pioneered the study of the relationships between crops and weather, developing sophisticated statistical techniques to transform sparse data into seemingly robust arguments about causative relationships between means, extremes and agricultural yields. In the immediate post-war period he was appointed meteorological advisor to the groundnut scheme, and urged the scheme’s managers to reconsider some of their locational choices based on his analysis of climatic conditions. First he was ignored, and then dismissed, before the scheme failed rather unceremoniously following low rainfall, equipment failures and struggles with the local soils. In a last ditch attempt to save the scheme, Walter’s successor at the East African Meteorological Department David Davies collaborated with the Overseas Food Corporation on a series of rainmaking experiments, with silver-iodide laden balloon bombs and flare guns launched at any passing cloud. While some apparent success was reported, the challenge of reliably attributing subsequent rain to human or natural causes proved insurmountable, and the efforts to finally make it rain on the groundnuts were quietly abandoned. For me, this case is a great opportunity to play around with some ideas about the role of scientific advice in colonial decision-making, and about the historical geographies of experimentation in the borderlands of science, government and commerce. There’ll also be opportunities to think about how this relates to more recent debates, not least through a session I’ve co-organised with James Palmer (Oxford) – ‘Boundary spaces in environmental politics: contested geographies of knowledge and power‘. I have a new paper out in the Journal of Historical Geography entitled ‘For an empire of ‘all types of climate’: meteorology as an imperial science’. It can be found on the publisher’s website here, and a pre-publication version of the article can be downloaded here. The paper is the main output of the RGS-IBG funded project which I conducted at King’s College London, and essentially lays the groundwork for the research I’ll be doing at Nottingham. It focuses on a series of conferences held periodically from 1919 onwards, generally titled the Conferences of Empire Meteorologists. These events, and the document trails they left behind, offer a useful synoptic view of how the sciences of meteorology and climatology were evolving alongside the shifting priorities and practices of British imperialism. They also offer the opportunity to develop a richer understanding of the role of conferences themselves in convening, coordinating, and contesting imperial scientific practices – something which resonates with the work my colleagues Steve Legg, Jake Hodder and Mike Heffernan are doing here at Nottingham on conferences and interwar internationalism. In the paper I follow the story of these conferences chronologically, beginning in 1919 with efforts on the part of British meteorologists to integrate the science into processes of post-war national and imperial reconstruction. Meteorologists from the Dominions – rather than the wider colonial empire – gathered at the Royal Society to discuss what the increasing militarization of the atmosphere meant for their science, and to figure out ways of better coordinating the activities of what were, in most cases, very young meteorological services. In 1929 the empire meteorologists gathered again – this time with the colonies represented too – and it’s clear that by this time the ‘imperial significance’ of the science had been recognised not just by the meteorologists themselves, but by their patrons and paymasters in government. Ministerial receptions and official dinners were laid on by the Air Ministry, visits were organised to inspect Britain’s ‘elaborate’ meteorological infrastructure, and regular press releases were fed to the print media as the public and political significance of the atmospheric sciences became ever clearer. The rise of civilian and military aviation was the key factor, and much of the 1929 conference was dedicated to working out what sort of meteorological knowledges and techniques were required to facilitate the safe traversal of Britain’s colonial empire by new fleets of trans-continental aeroplanes and, it was hoped, airships. All was not always rosy in the empire meteorological club, and the conferences provide an opportunity to understand the tensions which existed between metropolitan and colonial weather men. Figures like British East Africa’s Albert Walter stridently insisted that meteorological techniques could not be transplanted wholesale from London to the colonies, but needed adaptation both to local climates and to local scientific capacities. In the 1929 and 1935 conferences, we can see how collectively the imperial meteorologists began to position themselves as spokespeople for a global climatic diversity which they saw as being largely overlooked by the International Meteorological Organisation – a body which at the time was dominated by European and North American weather services. I therefore argue that the evolution of meteorological internationalism in this period cannot be understood without reference to the infrastructures and practices of imperial meteorology, and that empire is an important way in which the science became ‘global’, both in its subject matter and in its practices. This idea of the British Empire’s unique climatic diversity also fed into desires to find much more instrumental applications of meteorology, with the Empire Marketing Board (EMB) for example sponsoring a section of the 1929 conference dedicated to agricultural meteorology. For the EMB, the Empire’s climatic diversity was not just an epistemic resource but an economic one too, and plans were hatched for meteorological knowledge to be better integrated with agricultural research in order to stimulate a more vibrant imperial agricultural economy. However, the meteorologists were not wholly convinced of the value or practicality of such applied work, and much bickering ensued about, for example, the meaning and significance of concepts like ‘micro-climate’ to the work of professional meteorologists. Understanding agricultural meteorology as a contested ‘trading zone‘ between different disciplines is something I want to pursue further, with Albert Walter’s rather tortured involvement in the ill-fated postwar ‘groundnut scheme’ offering a good case study of the trouble that could ensue when different forms of expertise clashed amid desperate attempts to stimulate flagging colonial economies. In the postwar and Cold War periods imperial forms of scientific cooperation increasingly gave way to new forms of scientific globalism, most notably in this context in the rise of the World Meteorological Organisation [pdf]. In the interwar period the Empire conferences had always been held before major international meteorology meetings, as if to coordinate the ‘imperial position’. Now though they started to be held after WMO meetings and they took on an increasingly informal tone. However, one interesting strand that I want to follow up on is the role of the Commonwealth in the circulation of ideas about anthropogenic climate change in the 1970s and 1980s. Climate change became a key topic for the Conferences of Commonwealth Meteorologists, as they became known, and there’s an interesting question about the role of the Commonwealth -with its high number of small island states – in the development of particular notions of collective vulnerability and of collective political identities. So, lots to follow up on, and I hope that my new project will be able to go beyond the documentary traces of metropolitan coordination to explore more fully the histories and geographies of colonial meteorology, and its imbrications with different forms of colonial government and culture.